IANDS relies almost exclusively on the generosity of its donors, members and volunteers to carry out its mission and vision. THANK YOU for wishing to help us in our efforts! IANDS is a 501(c)(3) non-profit charitable organization. Donations are fully U.S. tax deductible. If you are considering making a bequest to IANDS, please visit the IANDS Bequest Society page. Review the donation options below and call 1-919-383-7940 during business hours (EST) to make a donation with your credit card by phone. Book Publication Fund - help us deliver important NDE-related research publications such as the research book The Self Does Not Die translated into Spanish (El Yo No Muere) and the Foundations of Near-Death Research anthology of landmark Journal articles. Friends of IANDS Giving Circle - help us deliver the Near-Death message more succinctly and fulfill our Wish List to develop new programs that will allow us to grow, build and disseminate. Col. Diane Corcoran Veteran's Fund - develop and deliver NDE educational outreach programs to veteran and military hospitals. Includes promoting the Veterans Video for veterans and veteran caregivers, Understanding Veterans' Near-Death Experiences. For more information, click here. Light the Way Fund - helps build the capacity of IANDS to fulfill its mission. PMH Atwater Research Fund - supports projects such as updating the NDE Periodical Literature Index, maintaining the archive of experiencer accounts and providing occasional direct grants to researchers, for example on NDE aftereffects, including electrical sensitivity and IQ enhancements. 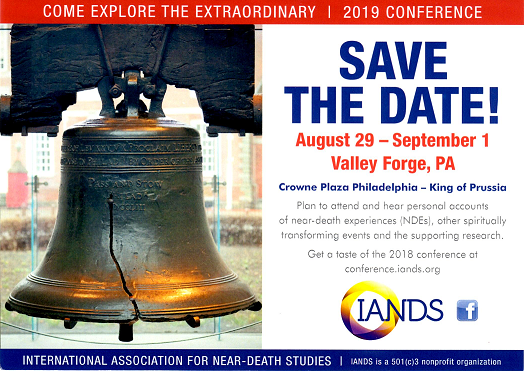 Sandi Rogers Conference Scholarship Fund - helps near-death experiencers attend the annual IANDS Conference who otherwise would not be able to. In memory of Sandi Rogers. For information about past IANDS Conferences, click here. Angel Fund - helps provide IANDS memberships to those who otherwise could not afford to be a member.